We're now down to our final wedding blog post and I've enjoyed writing about it as much as I enjoyed the whole journey; I hope you learned something from me. Here are ten realizations I had after #RANawaywithMartha. 1. I realized that the shorter the preparation time is, the lesser the expense. 6 months since we planned the wedding, our cost ballooned to 600% of what our ideal budget was just to come up with a good wedding, but thanks to our family and friends who supported us all the way, we were able to hit that amount. 3. I realized that there are people who are actually willing to help. Weddings restore your faith in humanity somehow. 4. I realized that you should stick with your plan no matter what people say; left and right, you will hear advice and opinions, and this will disrupt the process and delay everything so listen, but take everything with a grain of salt; people will always have something to say about the type of wedding you'll have and your choices, but it's your money and your wedding anyway so stick to your guns and don't let negative opinions discourage you. 5. I realized that you should always have a plan B--always. 6. I realized that it is important to have extra money, at least 15-20% of your original budget because you will always have something major to spend on weeks or days before your wedding or heck, even on the day of the wedding; it's best to have a buffer amount so you don't end up borrowing money too. 7. I realized that the wedding is the best time to use all your cards: friendship cards, work cards, colleague cards, Blogger cards, etc. LOL. 8. I realized how beautiful and meaningful it is to have a small guest list; well, 115 is not a small guest list, but it's smaller than most since a couple will always have a minimum of 150 guests; a lot were even expecting I'd have over 200 due to my blogger status; a small guest list comprised of all the most important people in your life makes the wedding more worthwhile versus having a large guest list where you don't even know half of the people in the room. 9. I realized the power of asking help; it is not vulnerability, it is learning. 10. I realized that it's important to enjoy the process for you to enjoy the outcome! I hope you enjoyed this. If my wedding blog posts have helped you, pass it on and help others too. #RANawaywithMartha Wedding Blog Post 3: The best wedding coordinator + cake rental for your wedding? 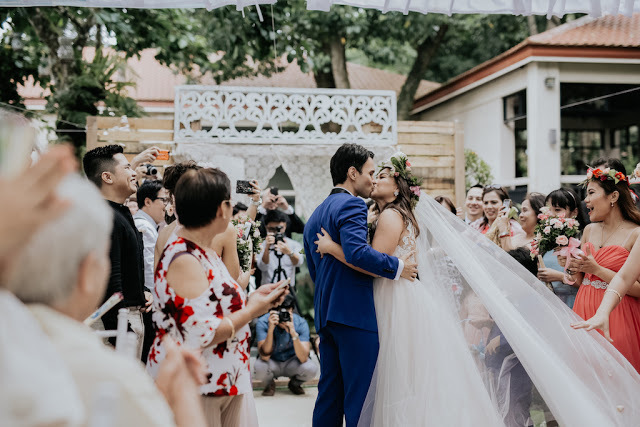 #RANawaywithMartha Wedding Blog Post 6: My Chosen Photo and Video Coverage Team + Tips in Choosing Your Video Theme and Team + Wedding Photos and SDE. It's true na the shorter time to do a plan for a event, the easy way to make it wonderful. Kasi nga pag matagal maraming destruction. And it's true to always have Plan B or option B, just in case na may aberya. I noticed din nga na wala kang guest na mga blogger friends. Anyway mas ok na din na family, relatives and close friends to make it simple and sentimental. I have no words for your wedding, Ms. Martha! It's absolutely just so beautiful! Your team didn't fall short or anything. I've learned a lot as well. Especially when it comes to sticking with the original plan since it is your wedding after all. I've watched several episodes of Say Yes to the Dress where the bride just gets torn apart when choosing the right wedding dress because of so many distractions and opinions from people. Some just end up with no dress from the show at all. I'm glad you ended up with wonderful choices, Ms. Martha. I'm happy that you have people who help you get through this. It's also so nice that you included the tip with plan B and extra money since we can never be too prepared indeed. The guest list is so important as well. I'd prefer a smaller list too! It's more intimate that well and I'd like to get a chance to talk to every person in the room and just be as close to them as possible, instead of having a room full of people you can barely talk to or approach 'cause they're just too many of 'em. God bless on your marriage, Ms. Martha! I am into intimate wedding. I had one. Only my love ones and most treasured friends. You're right that lesser time make you decide precisely and with our outcome, right choices. Cheers to a blessed unity of two hearts truly in-love!